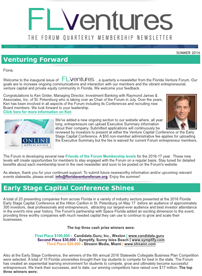 Sign-up today to receive the FLVentures newsletter, a quarterly e-newsletter for the Florida Venture Forum membership community. Our goals are to increase ongoing communications and interaction with our members and the vibrant entrepreneurial, venture capital and private equity community in Florida. Sign up! © Florida Venture Forum, Inc.